Over the past thirteen—Gulp! That can’t be right!—years welcoming guests at Brigolante, I have come to realize that about 95% of their queries are repeat questions. Some of these I have template emails for (i.e. Do you have driving directions to reach you? ), some of these I have pages in our welcome packet for (i.e. How does the washing machine work? ), some of these I have Slowtalk for (i.e. Which is the best credit card to use in Italy? ), some of these I have local friends for (i.e. Where does one buy an accordian, anyway?). And some of these I am gradually trying to answer here on my blog, which is why there is a drily-yet-concisely-entitled category called Trip Planning Tips for Umbria. One of the most common travel advice guests require is help in planning an itinerary for Umbria, which is also one of my favorite questions to answer. Here is a week long suggested itinerary for visiting Umbria which throws in the crème della crème of the region: art and history, towns and parks, food and drink, people and shopping. It may not suit everyone, but feel free to use it as a guideline for planning your trip. A week is not enough time to properly visit Umbria, but I recognize that guests have minor inconveniences like Jobs and Families which restrict their holiday time. Come back soon for a two week itinerary, which will be much more complete. I am writing primarily for our guests, so I presume your base is Brigolante or, at very least, Assisi. If you are staying in another town in Umbria, you will have to make some adaptations. I presume you have a car. I am neither for turtle nor hare travel, so each day has enough to keep you busy, with enough time left over to add/linger/meander/get lost/come home and relax. Yes, I know you are chomping at the bit to visit Assisi, but believe me, Sunday is not the day to do it. This is the most crowded day of the week, when day trippers from Tuscany and Rome fill up the parking lots and churches. In fact, not only do I suggest you avoid visiting Assisi proper…I suggest you avoid driving through town altogether. Instead, follow the winding provincial highway 444 from Brigolante to Gubbio (make sure to enjoy the beautiful drive through the Appennine foothills between Assisi and Gubbio). This archetypical medieval walled town is a perfect place to begin to get to know Umbria. Its roots are steeped in the ancient Umbrii people (the town houses the most important example of the Umbrian language on the Eugubine Tablets in the Civic Museum), passes through Roman civilization (there is a wonderful view of the town from the Roman Theatre in the valley below), and remains largely architecturally frozen in the middle ages. Be sure to dine on truffles while you’re there, and work off your hearty lunch with a climb (or, if you’re feeling lazy, the funivia car…no one will ever know) to the top of Mount Ingino where you can visit the sanctuary dedicated to Gubbio’s patron saint and enjoy the amazing views from the Rocca fortress. Ah, now we’re talking. Assisi can get crowded with coach tours from late morning through the afternoon, so get yourself to the Basilica of Saint Francis as early as you can to enjoy the view, the church, and the famed frescoes virtually to yourself. From here, leisurely spend the rest of the morning exploring the town (don’t miss the Roman temple in the Piazza del Comune and the surprisingly lovely museum under the Cathedral of San Rufino) and partaking in a little Italian culture by having a slow lunch. In the afternoon, climb up to the dramatic Rocca fortress (be sure you make it to the “highest room of the tallest tower” for the best photos of your holiday), then hop back into the car to visit San Damiano and the Eremo delle Carceri. These two shrines will give you a much better sense of who Francis was as a man and Saint than his opulent basilica ever can. If you are a sunset person (I’m a sunset person), continue along the road past the Eremo to the top of Mount Subasio. A little luck, the right weather, and a bottle of wine may just be the perfect storm for one of the most stunning sunsets of your life. You’ve had two towny days, it’s time to see the other side of Italy’s Green Heart: her lovely parks. 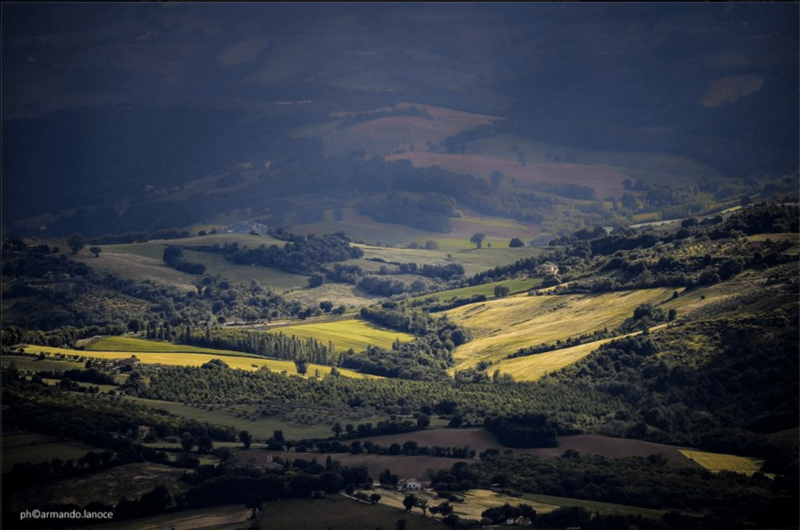 Umbria has seven regional parks and one national park…a surprising number for one of the smallest regions in Italy. You’ve already visited one of the regional parks…in fact, you’re sleeping in one as Brigolante is within the borders of the Mount Subasio Park (as is the entire town of Assisi) Today I suggest you go further afield and visit one of the other parks in the region…two of my favorites are the Sibilline National Park with its breathtaking plateau Piano Grande (you can work in a visit to pretty Norcia…don’t waste your time with Castelluccio, which is much prettier from afar) and the Nera River Regional Park, winding your way along highway SS209 which skirts the Nera river and runs under steep mountainsides where tiny villages perch precariously. Stop by the beautiful Marmore waterfalls (check times when the falls are running here) and the gorgeous San Pietro in Valle abbey…two of the best kept secrets in Umbria. Umbria’s provincial capital may seem daunting, with its modern suburbs surrounding the historic center, but don’t be put off. Find your way to the Piazza Partigiani parking lot and take the series of escalators passing through the underground remains of the medieval center, which now form the foundation for the modern city above. Have a good guide on hand; Perugia is full of interesting churches, monuments, and museums. My favorites are the Galleria Nazionale dell’Umbria and the Oratorio di San Bernardino. After lunch and a post-prandial stroll (and a caffè and pastry at Pasticceria Sandri on the Corso), you may still have the time and energy continue touring. I have two suggestions to fill your afternoon: 1) Deruta. If you are interested in seeing this famed artisan majolica production, head here. Shop, walk, have dinner at the elegant Forziere Antico. 2) Lake Trasimeno. If you are more enthusiastic about a pretty drive or walk, head to the lake. Castiglione del Lago is a lovely town to visit, and one of my favorite spots for dinner in Umbria is Rosso di Sera in San Feliciano. You’ve seen the towns (and the City), you’ve seen the nature. Now it’s time to see the people. Unfailingly, my guests name the day they took a tour and/or course as their most memorable day in Umbria and I can’t speak highly enough of some of the guides and instructors in this area. When you spend time with someone familiar with the local history and culture it gives you a chance to really get to know Umbria and its people in a way you wouldn’t be able to by simply visiting monuments. So plan a day preparing a traditional meal with a local cook, touring the small family-run vineyards, learning to hunt truffles (and how to use them in the kitchen), or painting your own majolica ceramics. Alternately, get under the skin of a town or area with a knowledgeable guide. I especially like Discovering Umbria for food and wine tours, and native Umbrians Marco Bellanca (bellsista@yahoo.it) and Elizabetta Federici (bettafederici@gmail.com) for cultural visits. You won’t regret it. Okay, I was kind of stuck on Friday because it’s the last guaranteed day of daytripping (some of you won’t be able to squeeze in your last stop somewhere on Saturday because your spouse pounced on cheap airline tickets while late-night online surfing nine months ago and didn’t notice until it was too late that it involved being at the Rome airport at 4 am tomorrow) and there are still about 50 wonderful things to visit. See caveats. However, after much soul searching I decided that I can’t possibly send you home without having seen Orvieto’s cathedral. It is, simply put, one of the most stunning churches in Italy. You will be tempted to stop in Todi first, as it’s just off the highway, but push on to Orvieto past tranquil Lake Corbara. Once there, first book your time for the Orvieto Underground tour in the Piazza del Duomo’s tourist office, then backtrack to visit the sumptuous Duomo. Explore Orvieto under- and above-ground, don’t miss the curiosity of San Pietro’s well, and make sure you have some excellent local white wine with your lunch. Afterwards, head back to Todi and spend the afternoon in the small but surprisingly cosmopolitan center of this friendly hill town. Have dinner here, because it’s an easy highway drive back to Assisi. You’ve come full circle–from your first Umbrian town to your last, with the best of the region along the way. May you bring back a little piece of Italy’s Green Heart in your own. Arrivederci! I am a (Kiwi) Expat living in Thailand- and freelance writer. Really look forward to reading your posts in the future! I fell madly, hopelessly, irreversibly in love with Italy two years ago. Unlike the flightless bird that my Country-folk are named for, I have travelled most of my life. I have been to many places that rock my world, but none that stopped it completely- until Italy. Now like a love-lorn teenager I plan, obsess and dream about the days that I will call the ground under my feet, “Italian.” We (husband and two sons known as ‘the weapons of mass destruction’) are in the middle of buying a villa on the Umbrian Tuscan border). So thanks for the advice! Debbie, thanks for stopping by! Keep in touch if you end up in Umbria…we can meet for a cappuccio and a chat! This is a wonderful itinerary. Thanks! I’m glad you mentioned Montefalco, as I blindly stumbled upon it years ago and thought it was magic. (I wonder if it still feels totally un-touristy, like it’s just there waiting to be discovered?) I might add Deruta as a must for ceramics adddicts. And Orvieto, yes yes yes. Thanks, Jann. Yes, I think that Montefalco is currently my favorite Umbrian town…but I tend to be moody about playing favorites, so that might change! My hubby and I live in Louisiana and are planning our first trip to Italy. A gentleman told me we should go to Umbria and take day trips from there to see Tuscany, Florence, and Rome. What is your opinion on that. We are spending 2 weeks total but I was planning a week in Umbria and a week on the coast. Hi, Nicole, thanks for stopping by! I would divide your two weeks by flying into Rome and spending the first couple of nights there (Rome is on the big side to do justice to in just a day trip), then head to Umbria for a week (a day trip to Florence is doable from Umbria…it’s about 2 hours by train from Assisi), then the last couple of nights on the Maremma coast in Tuscany (that way you get in both the coast and Tuscany). You won’t need a car in Rome, but you should rent one for Umbria and Tuscany. Hello, I really enjoyed your post. I’ve enjoyed it so much, I would like to add it to my Pinterest board with the rest of my Italy bucket list. However, since you don’t have any photos, Pintetst won’t allow it, since it is an image based site. So many people are using Pinterest to corale the overwhelming data available on the internet, I feel your post runs the risk of being lost. Even one introductory image would solve this issue. I just discovered your website and am so glad for the information, we are planning a trip to Umbria in the fall. Thanks for the great descriptions and recommendations!